The dates below could be used to create a timeline of Captain Smith’s life on board different vessels. 5th Feb 1867 – 8th Feb 1868: EJ served as ‘Boy’ aboard his half brother’s ship, Senator Weber. 18th Oct 1870 – 6th March 1871: Able Seaman aboard the Amoy. 24th March – 15th July 1871: Able Seaman aboard Madge Wildfire. 24th Aug 1871 – 19th Jan 1872: 2nd mate aboard Record. 28th Feb – 27th July 1872: 2nd mate aboard the Agra. 27th Sept 1872 – 3rd March 1873: 2nd mate aboard the Quebec registered N. Mosher. 15th July 1873 – 4th May 1875: Served three terms as mate aboard the Liverpool registered Arzilla. May 1876 – Jan 1880: Smith’s first command, the 1040 ton Liverpool registered ship Lizzie Fennell. March 1880 – March 1882: Smith served as fourth and later third officer aboard the White Star S.S. Celtic. March 1882 – March 1884: Second officer aboard the S.S. Coptic in the Pacific service. March 1884 – July 1885: second officer aboard the S.S. Britannic. July 1885 – April 1887: first officer aboard the S.S. Republic. April – August 1887: Temporary command of S.S. Republic. August 1887 – February 1888: first officer aboard S.S. Britannic. April – May 1888: Commanded S.S. Baltic. June – September 1888: Commanded S.S. Britannic. December 1888: Command of the cattle transporter S.S. Cufic for her maiden voyage. January 1889: Command of S.S. Republic. April – July 1889: Commanded S.S. Celtic. December 1889 – February 1890: Commanded S.S. Coptic in the Australian service. 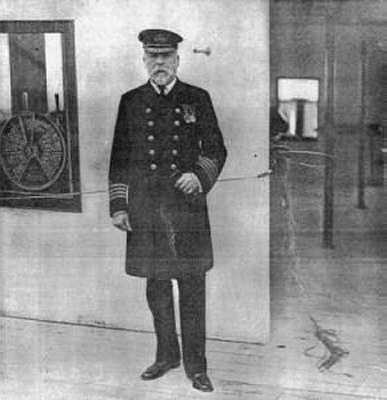 December 1890 – February 1891: Back to the North Atlantic as commander of S.S. Adriatic. March – April 1891: Commanded S.S. Runic. May 1891 – May 1893: Commanded S.S. Britannic. June 1893: Briefly in command of S.S. Adriatic. July 1893 – January 1895: Commanded S.S. Britannic. January 1895: Briefly back in command of S.S. Cufic. January – April 1895: Commanded S.S. Britannic. May – June 1895: Commanded S.S. Germanic. July 1895 – November 1902: Smith’s longest command, the S.S. Majestic, including two trips to South Africa, transporting troops to the Boer War. December 1902 – May 1903: Commanded S.S. Germanic, while Majestic was refitting. May 1903 – June 1904: Again commanded S.S. Majestic. 29th June 1904 – March 1907: Commanded the new R.M.S. Baltic. 8th May 1907 – February 1911: Commanded the new R.M.S. Adriatic. May 1911 – March 1912: Commanded the new R.M.S. Olympic. April 1912: Commanded R.M.S. Titanic. The majority of these details come from Smith’s own service records held at the National Maritime Museum in London.